We love cigar boxes and can’t stop collecting them! So we’re always looking for new ways to use them. 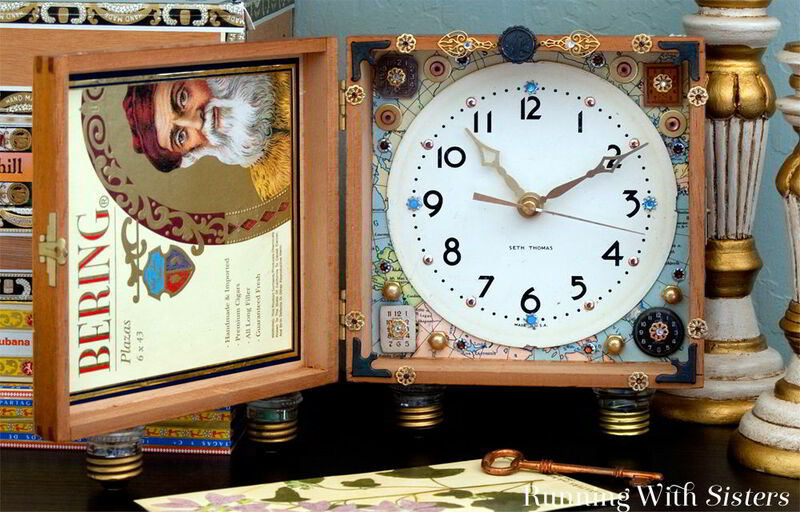 Like this Steampunk Cigar Box Clock! 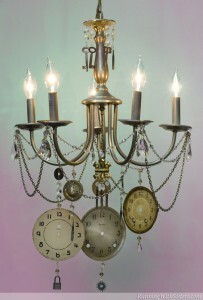 We made this mantel clock for our book Steampunk Chic. 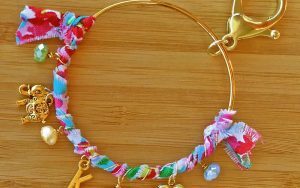 (You can take a peak at it here in our Etsy store. It’s a hoot!) 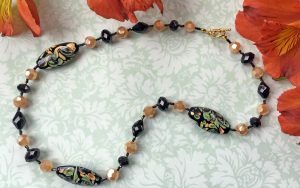 You can read a review of Steampunk Chic on FaveCrafts.com. It turns out making a clock is pretty easy with a clock kit, so we got to spend most of the time on the fun part – dressing it up in our own steampunk style! 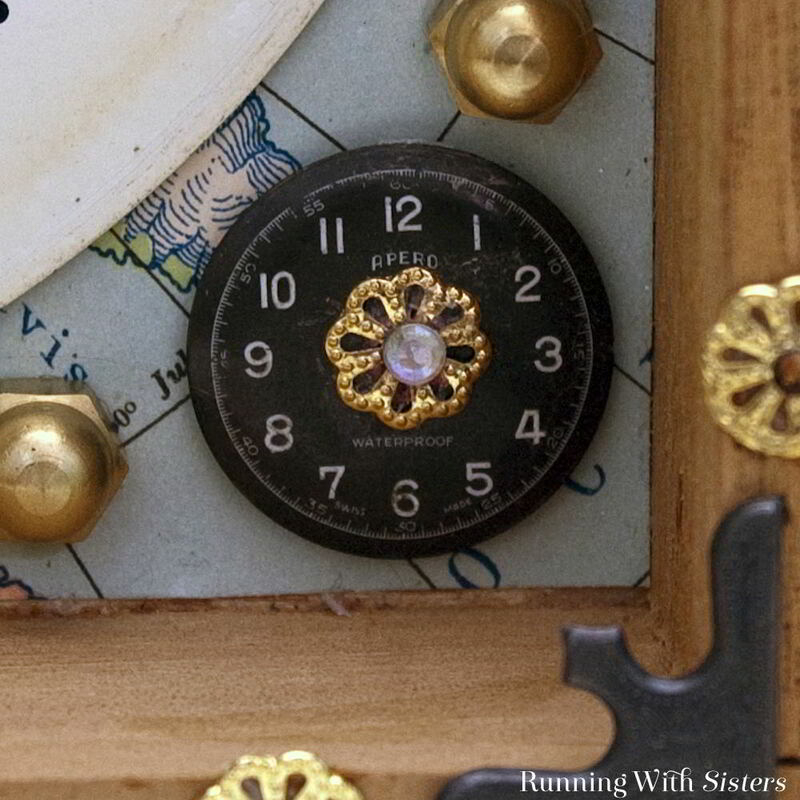 The best thing about a project like this is you can do whatever you want to style your cigar box clock. Just get creative and have fun! 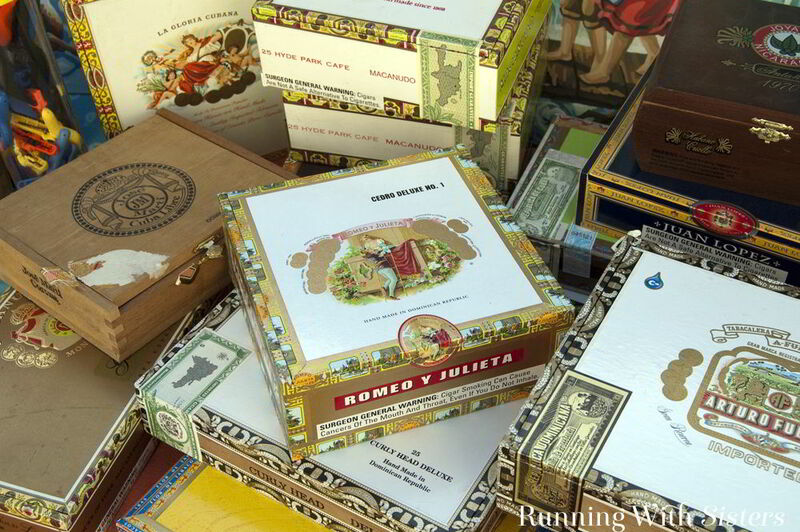 Do you love cigar boxes as much as we do? Here’s a tip: For some reason cigar boxes are a bit spendy at the flea market. We tend to get a better deal at local cigar shops. They usually sell them for just a buck or two. 1. Turn the cigar box over and find the center in the back. Drill a hole 5/16” in diameter. Separate the clock mechanism parts, keeping them in order. Poke the battery case shaft through the hole in the cigar box from back to front. 2. Cut the map to fit inside the back of the cigar box and cut a hole to slide the clock shaft through. Use the rubber cement to glue the map in place. 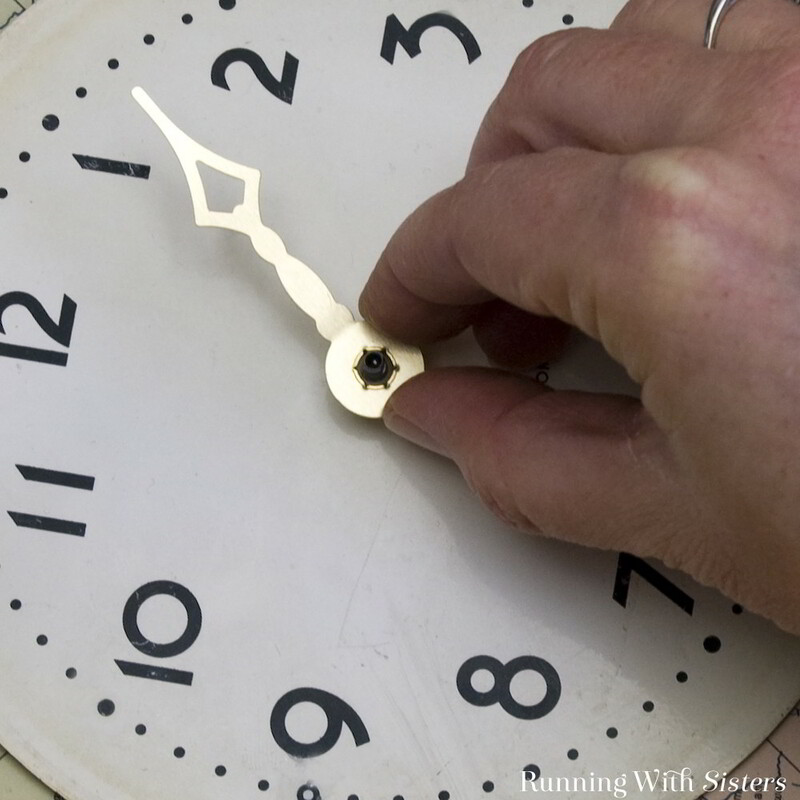 Dot the back of the clock face with Quick Grip and slide it onto the shaft over the map. Assemble the clock mechanism following the directions on the package, sliding the hour hand, minute hand, and second hand onto the shaft. 3. Using the Quick Grip, glue a shirt button to the back of each small watch face, then glue them to each corner of the map. Flatten 4 bead caps with a hammer on a jeweler’s block. 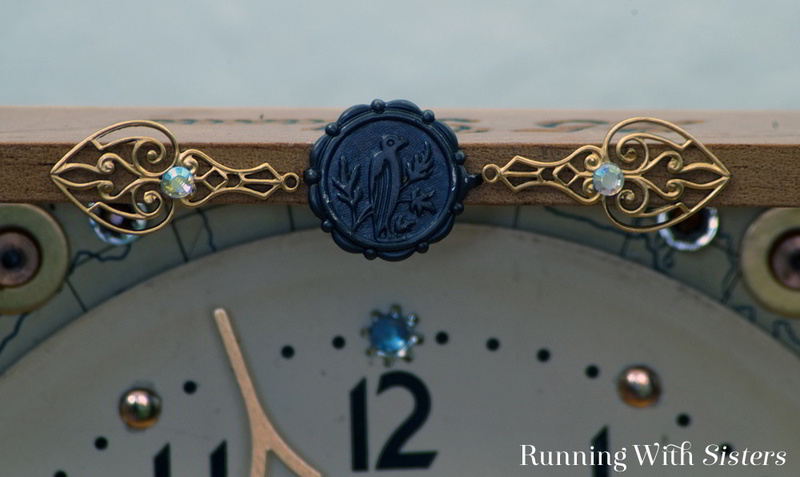 Glue one to the center of each watch face, then glue a crystal rhinestone to the center of each bead cap. 4. 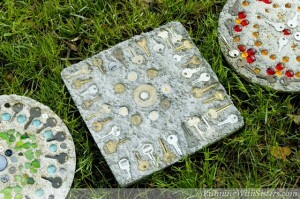 Glue 4 external-tooth locking washers to the clock face at the 12, 3, 6, and 9 o’clock positions. 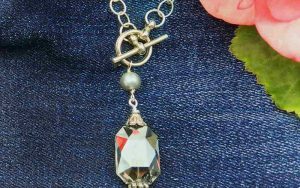 Glue a light blue rhinestone to the center of each locking washer. 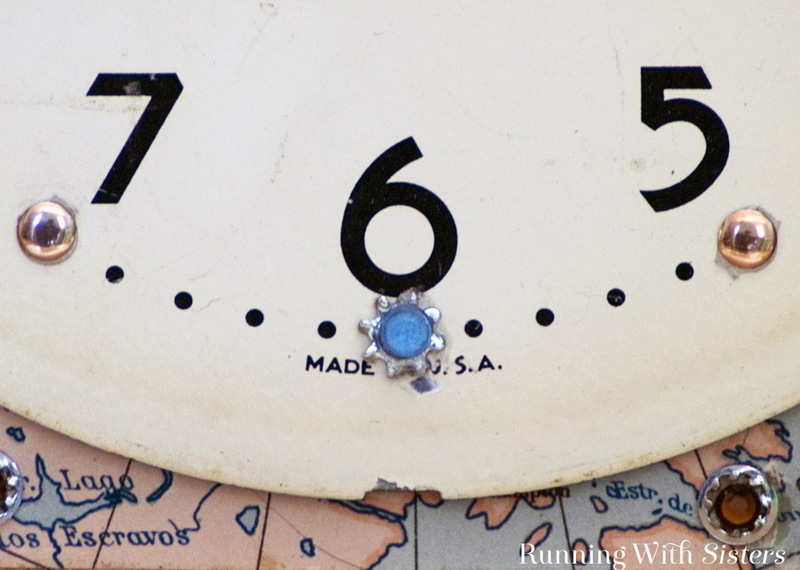 Place a nailhead sticker onto the clock face at the 1, 2, 4, 5, 7, 8, 10, and 11 o’clock positions. 5. Hammer the Vintaj corners to the front corners of the open cigar box. Nail the Vintaj bird rivet to the top of the open cigar box, centering it between the corners. 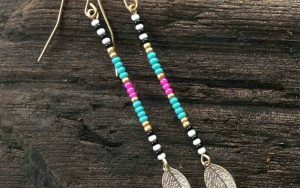 Nail one filigree drop to either side of the bird rivet. Use the Quick Grip to add one crystal AB rhinestone to each nail head. 6. Glue 8 hammered bead caps around the edge of the open cigar box, flanking the corner rivets. 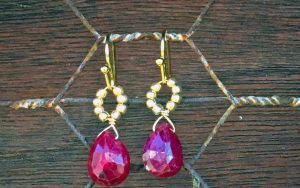 Glue a small topaz rhinestone to the center of each bead cap. Fill in the corners by flanking each of the top watch faces with 2 brass washers topped by copper spacers and 2 internal-tooth locking washers topped with large topaz rhinestones. Flank each of the bottom watch faces with 2 brass cap nuts and 2 internal-tooth locking washers topped with large topaz rhinestones. 7. Use the Quick Grip to glue the plug fuses to the bottom of the cigar box and lid as feet. 8. Load the AA battery into the clock mechanism and set the time. Tada! 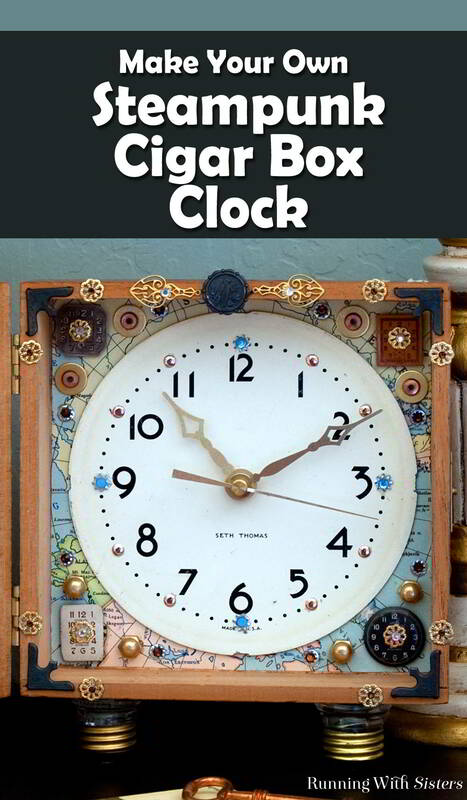 Steampunk Cigar Box Clock! How cool is that? 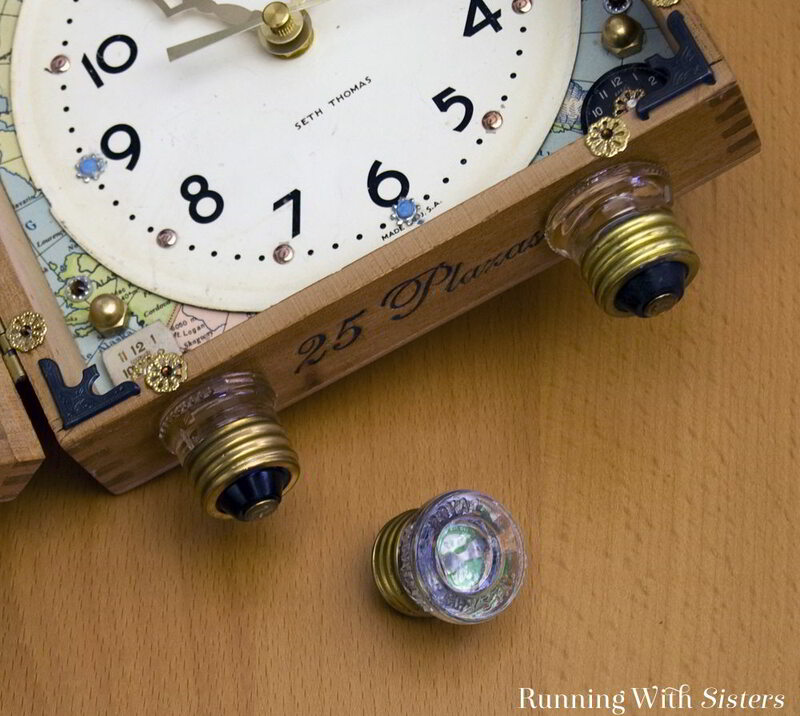 Have you ever turned a flea market find into a clock? What did you make? We’d love to hear about it! Leave us a comment! Thanks Dawn! We love how it turned out! 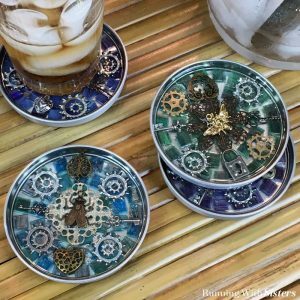 On your steampunk coasters, do you fill the resin to the top of the lid or leave a lip so the cup sits in the lid? It appears to have a lip but did not specify.